But one of the challenges of Threshold is time. The idea is to get everyone in the door and going on their academics to maximize learning time. It’s a personalized routine but still a routine. That means a bit of relationship building-but not as much as we’d ideally like. 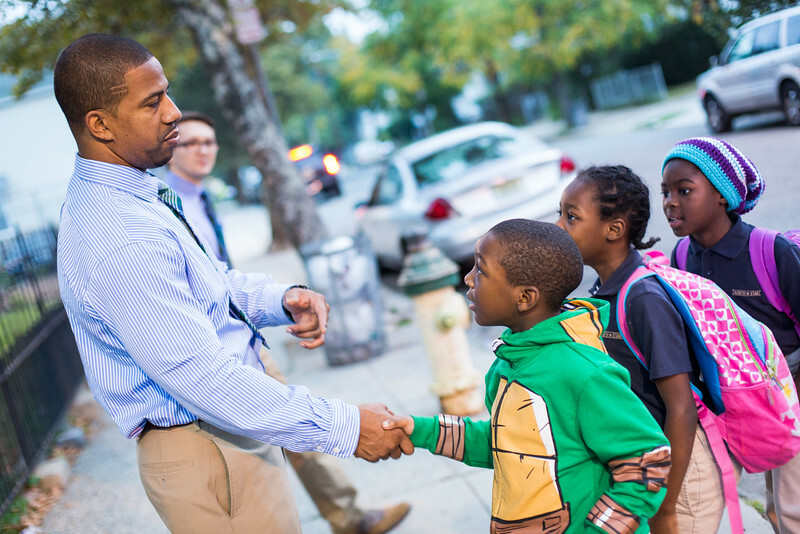 That’s why we love to see schools using an adaptation of threshold: greeting students as they arrive at school. Interestingly, we’ve seen schools make subtle adjustments over time in how they do this. The “arrival” greeting gives you all the culture-shaping benefits of Threshold but, critically, doesn’t have to be quite so beholden to time. You’re not trying to get everyone in the door to start science class in the next 30 seconds. Students are arriving within a span of five to fifteen minutes, say. They come in and have breakfast and make their way to homeroom or sit with their classmates and chat or do morning work or reading. This makes it much easier to stop and have a real chat–often with the kids who need the chat the most. We recently watched one of our top Deans, Shannon Benson of Alexander Street Elementary, do this. Out in front of the school on a winter morning in his coat and 49ers hat–shocking, that 49ers business, but for great people you make exceptions–he spotted a scholar with a scowl on his face. Since there was time and he wasn’t tied to the door–he and three colleagues were greeting as a group to allow for just this kind of flexible interaction while still greeting every child–he approached him, offered a warm good morning and began to subtly assess. He began by noting that he and the scholar had the same coat on-a way of both connecting and gauging the student’s response, which remained taciturn. It was enough to allow Shannon to remark that the scholar didn’t seem like himself. What was up? “But,” Shannon added, “You’ve gotta do the work first. You got it? YOU have to do the work.” They spent another minute or so on this: What did it mean to ‘do the work?’ Why? Did he think he could? etc. and the student went inside. He wasn’t skipping, but his body language was totally different. He had a plan and he knew that an adult in the building understood and cared about him. The interaction took about 3 and a half minutes. It was firm but also calm, warm and caring. It helped the student avoid an unproductive day and just possibly ensured that he didn’t end up making a visit to Mr Benson’s office later. In other words it was a ideal use of a greeting at the door to notice and address the needs of a student. And to be fair there were a lot of other things Shannon did that morning. He greeted several parents by name and shaking their hands, welcomed dozens of students warmly, often with a pat on the back or a short chat. He helped one student whose shoes were on the wrong feet switch them. He reminded another to tuck in a shirt. It was, in short, an exercise in support, prevention and relationship building- an adaptation of Threshold to a new and different setting that we often see in top schools–even if no one does it quite like Shannon.